Colour: The usual artificial amber from too much E150(a). On the nose it is smoky, all right. That’s the first impression I get. What kind of smoke? I’m guessing Islay by the hints of phenols and iodine. However before I really get to nose it, the smoke has already disappeared into the background, mingling with sweeter notes lying underneath. A well-blended malt is so layered and complex that it’s hard to make out individual components. While not overwhelmingly in-your-face, this happens to be the case here. Sweet oranges, orange rind, white raisins, caramel, medium-ripe banana and dates. Fresh tropical fruit salad, some aniseed, cough lozenges. The herbal notes get more and more apparent the longer you leave the malt in the glass. All very tightly packed together. On the palate there’s surprisingly little smokiness, the peated part expresses itself more on the briny, salty, dry, slightly bitter side. A rich combination of said brine with clearly dominating sweet, rich, dark-ish fruits (think of a puree of dates, figs, raisins and the likes), as oily and coating as it can be at 40% ABV. Even harder to pick out individual aromas than on the nose. The finish is initially oily and sweet, drying down to reveal herbal notes and hints of smoke. Medium long. 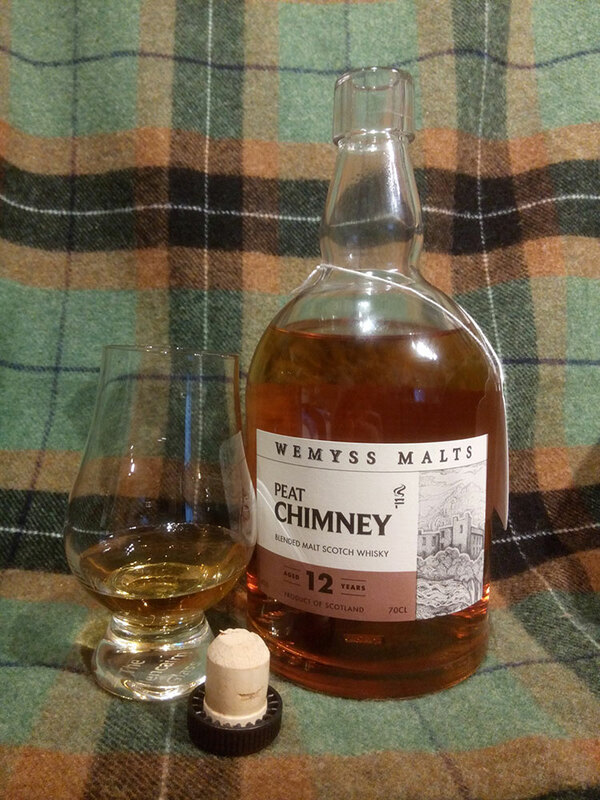 Peat Chimney? Really? Well, if you expect what’s written on the label, you could say this blended malt – meaning a blend of different single malts without any grain whisky – is a disappointment. The smoky notes are only really noticeable on the nose and even there only initially before they fade in the background. On the other hand, “disappointing” doesn’t describe the contents of the bottle at all. Wemyss Malts, the owners of the just opened Kingsbarns Distillery, have delivered a well-rounded, mellow, easy-sipping, medium-smoky blended malt. At a price point of 35€ it is well worth picking up. The only real complain I have, as readers of my blog will already have guessed, is this: Ditch the caramel colouring and chill filtration and bottle at 46% to make it even more rich and oily.